The Bradford Landmark Society will be sponsoring a presentation of “A Christmas Carol “ on December 11th. The performance will be at 2:00 p.m. in the Bromeley Family Theater at the University of Pittsburgh at Bradford. Tickets for the show are now available at Herbig Bakery (Bradford Landmark Society headquarters); John William’s European Pastry Shoppe; Graham’s Florist; Tina’s Hallmark; Ott and McHenry Drug Store and the Bradford Area Public Library. Adult tickets are $15.00, students age 10 to 18 are $10.00. This presentation is not intended for children under 10 years of age. It is encouraged to purchase tickets early to ensure a seat. This Charles Dickens favorite will be presented by Mike Randall of Buffalo, NY, as a solo performance. great to have Mr. Dickens back in Western New York! blending of author/actor creating wonderful magic on stage. entertainer. Mike Randall is also a member of the Puppeteers of America. Goulet. Mike has been with WKBW-TV since August 1983.
fund-raisers for numerous charitable organizations across Western New York. Meteorological Society and National Weather Association Seals Of Approval. Regarding his performance of this holiday favorite, The Buffalo News wrote: "Mike Randall - a talented actor and magnetic stage presence - when Randall loses himself in one of those Dickensian bouts of rich description, he's at the top of his game. Randall's close adherence to historical documents relating to Dickens' performance means that he presents us with the author stripped down to his essence. 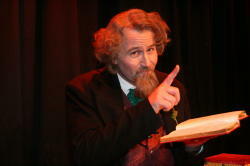 The man, his words and no more, Randall seems to be saying, are all that is required to enjoy "A Christmas Carol." And he's absolutely right." For more information on the performance contact the Bradford Landmark Society.